This is the old listing and is no longer updated. The current listing of carfree places is maintained on Wikipedia. The carfree test has not been rigorously applied. Some areas with minimal, low-impact car usage have been included; these should be identified as such. Transit service was not directly considered. Some areas may have no transit service within the carfree area; others may have fairly (even irritatingly) high levels of bus traffic or other public transport. Wohen Ohne Auto maintains a listing in German. Size of carfree district in whatever measure is convenient - percentage, blocks, hectares, housing units, etc. Description of the character of the area: mixed use, resort, medieval, etc. Venice Most or all of the city is essentially carfree. Kids can play in most streets. 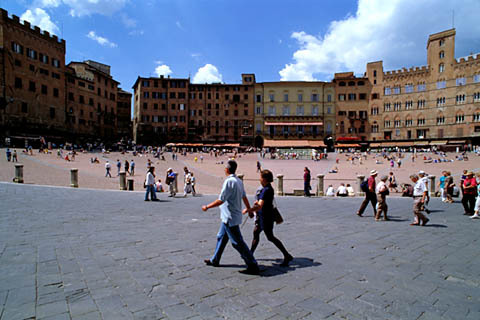 Siena Large area that is nearly carfree; pedestrians may still occasionally have to avoid cars. Parma Worthy of inclusion, but extent is limited or vehicles sometimes intrude appreciably. Many, even most, European cities of any size include at least a small carfree area, almost always in the old heart of the city. These are not mentioned in the list below unless they are in some respect unusual. Rome Several streets west of the Vatican ? ? Orta San Giulio (reportedly) ? ? ? Winterthur Historic center ? ? Lugano Most of the old quarter ? ? Nürnberg 9 km of carfree streets ? ? Stuttgart 6.9 km of carfree streets ? ? Lindau Historic center ? ? Rothenburg ob der Tauber ? 13,000 ? Tübingen (converted military base) ? 6000 residents, 2000 jobs ? Rue Mouffetard, Paris 0.5 km ? ? The walking mall next to St. Germain, Paris is about 1.5 km long and runs from place Odeon to rue Monge ? ? Montorgueil area, Paris ? ? ? La Rochelle Carfree area and anti-car policies 80,000 (entire city) ? Faro Some of the downtown area 50,000 (whole city) 6-8 nice old streets that form a small network right in the center of town; very pleasant. Tavira Some of the old downtown 25,000 (whole city) Narrow, winding streets in the old part of town. Évora Most of the old walled city 8500 (in the walled city) This is an odd situation. The streets are so narrow that cars can't park on most of them, so the city has the look of a carfree city, but because of the highly irresponsible way that drivers rocket through the narrow streets, it certainly doesn't feel like a carfree city. Some areas are genuinely carfree (especially those streets with steps!). Carfree.com has issued a Travel Warning for Évora; read my open letter to the governor for more information. Edinburgh Slateford Green carfree development ? ? Feldkirch Historic center ? ? Seville Santa Cruz district has many narrow, carfree streets ? ? Santiago de Compostela Large central pedestrian zone ? ? Algeciras Large network of carless shopping streets ? ? Arbat Street, Moscow Small district ? Old area just outside the historic center. Madison, San Francisco, and Las Vegas were all reported to have single carfree streets, which is not sufficient to merit inclusion under the current standard. East Lake Commons, metro Atlanta 67 dwellings planned Probably 200 Parking will be located on the perimeter of the village. Access within the village core will be by walking, carts, and bicycles. Boulder, Colorado Pedestrian mall ? At the city center; there is some debate as to whether this really is a carfree area or not. Calgary, Alberta 7 & 8th Avenue Malls ? 7th Ave. is a transit mall; 8th Ave. is a pedestrian mall for several blocks. Calgary also has the "Plus-15" second-story system that connects many buildings in downtown. It totals more than 16 km. of passages. Montreal, Quebec 30 kilometers of underground passages Non-residential Carfree network of underground passages and shopping centers; rollerbladers and cyclists not permitted. The passages link some 60 large commercial, administrative, and apartment buildings in downtown. San José, Costa Rica Several streets in the downtown area ? Several areas of the city have carfree sections, the largest being seven blocks long with side streets. The area is the commercial and civic center of the city and includes the plaza adjacent to the gorgeous Theatro Nacional. Tortuguero, Costa Rica Town on a coastal island 1000 Access by boat or airplane. There are no roads, only sidewalks and jungle paths connecting the buildings. According to Michael Totten, "It is the most relaxing and humanly scaled place I have ever been in the world." Bogotá, Colombia The Ciclovía , 110 kilometers of roads throughout the city 6.5 million The Ciclovía roads are closed to traffic Sundays and holidays for 7 hours, from 0700 to 1400, when more than 1.5 million people practice various sports, visit the recreational facilities, or go to cycle-mass. The city also plans to become largely carfree during rush hour by the year 2015. Hopetown, Barbados (reportedly) ? ? When JHC visited in 1991, there was no substantial carfree area. Anyone know for sure? Southbank, Melbourne Significant carfree sections ? ? Swanston Walk and Bourke Street Mall, Melbourne ? ? Open to trams but closed to cars (except Swanston, which is open to cars at night). We have further been advised that Swanston walk is "open to taxis/trucks/commercial vehicles 24 hours a day, and never free from people using it regardless of the law," and that Bourke Street Mall "is used by commercial vehicles also." Sorry! According to one reporter, most towns have covered (i.e., carfree) streets. Tokyo ? ? Some of Tokyo's major shopping areas are closed to auto traffic on Sundays; these areas are called "pedestrian paradises." Ueno area, next to the railway station Several streets ? ? Shizuoka One kilometer of underground passages 470,000 in city Carfree network of underground passages and shops. The street above has traffic calming and wide sidewalks. Osaka, Namba area 2 long streets ? ? Osaka, Tenma area A street 2.6 km long ? ? Kobe Several streets in downtown ? ? Cheung Chau Island, (and others) off Hong Kong ? ? ? Zhouzhuang, one of a number of small carfree towns (Xitang, Tong Li, possibly Wu Zhen) in the "water district" of Shanghai Area right along the river 2000 in the town Old carfree waterfront town that resembles Venice in some ways, including heavy tourist traffic. Marrakesh The souk ? While the souk is carfree, the old areas nearby are not. Motorbikes plague nearly all streets.